In the tradition of Friday Night Lights and Outcasts United, ONE GOAL tells the inspiring story of the soccer team in a town bristling with racial tension that united Somali refugees and multi-generation Mainers in their quest for state--and ultimately national--glory. When thousands of Somali refugees resettled in Lewiston, Maine, a struggling, overwhelmingly white town, longtime residents grew uneasy. Then the mayor wrote a letter asking Somalis to stop coming, which became a national story. While scandal threatened to subsume the town, its high school's soccer coach integrated Somali kids onto his team, and their passion began to heal old wounds. 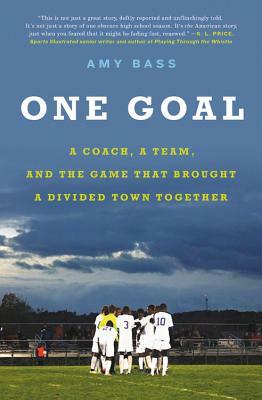 Taking readers behind the tumult of this controversial team--and onto the pitch where the teammates vied to become state champions and achieved a vital sense of understanding--ONE GOAL is a timely story about overcoming the prejudices that divide us. A professor of history in New York, Amy Bass lived in Lewiston, Maine for four years as a student at Bates College. Her writing has appeared in Slate, Salon, and CNN Opinion, and her work for NBC's Olympics coverage earned her an Emmy in 2012 for Outstanding Live Event Turnaround. One Goal is her fourth book. "The perfect parable for our time." "A lively, informative, and entertaining...underdog story that skillfully blends elements of human compassion, passion for a sport, determination, and endurance with overtones of societal pressure and racism. It's an exhilarating narrative that shows how perseverance and the ability to disregard the narrow-mindedness of xenophobia can lead to victory....An edifying and adrenaline-charged tale." "A story that is not only relevant to our national discourse, but essential. This is a book about the big 'isms,' but it is most of all a book about human beings, compellingly and movingly rendered." "In this gripping account of Lewiston's journey to its first-ever high-school soccer state championship, history professor Bass vividly tells the stories of the Somalis and Lewiston, exploring the resistance and racism the refugees faced in town and on the field....a heartening example of sport's ability to bring people together...Engrossing and informative." courageous characters will make you smile. "Amy Bass's book transcends sports and provides encouragement in discouraging times." town in Maine and connected so many people. arms to the children of those immigrants.